The durability and cool sweet smoking of the Alfred Dunhill pipe with its “White Spot” trademark are universally acclaimed. Made from the finest quality briar, the “Dunhill” represents more than 90 separate processes over a period of several months. While there are checks and quality controls every step of the way, the final inspection before each pipe is released onto the market is made by only one person. An indication of the scarcity of fine briar to meet the standards demanded of a Dunhill “White Spot” pipe. These standards ensure that each pipe will smoke perfectly from the start and, with proper care, will never lose its original sweetness. The flawless briars are perfect – no fills, no flaws, no pits; only 5 out of every 100 ebauchons entering the factory leave as a Dunhill. The mouthpiece of every Dunhill pipe is hand-cut from a solid rod of “Vulcanite” – the Dunhill name for a rubber compound which, although tough, is easy on the teeth and does not flavour/taint the smoke. In colour it may be Black, or Cumberland (marbled brown). Dunhill pipes have an exceptionally long life and are in great demand as refurbished “estate” pipes. They are highly regarded as “Collectibles”. The pictures show specific pipes we are holding for you. The pipe you see is the pipe you will receive. The series of Dunhill Christmas pipes features the 12-year theme ‘The Nutcracker and the Mouse King’, which began in 2011 and will end in 2022. It is based the characters of the children’s book ‘The Nutcracker and the Mouse King’ by German author Ernst Theodor Amadeus Hoffmann, and the famous ballet ‘The Nutcracker’ by Russian composer Pyotr Ilyich Tchaikovsky. 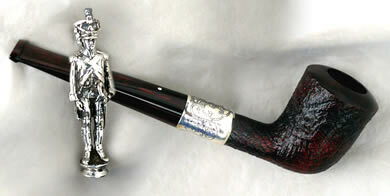 The pipe features a wide Sterling Silver band intricately engraved with scrollwork and the image of the character. This series is strictly limited to annually only 300 pipes worldwide. Fritz Stahlbaum, Maria’s mischievous brother, is the subject of the 2014 pipe (4th in the series). His name is on the .925 (Sterling Silver) band, and the tamper shows him hiding the nutcracker behind his back. The pipe is a Group 5 Cumberland in the unusual, comfortable “Diplomat” shape. This being the 3rd pipe in the series, it depicts Maria Stahlbaum, the young heroine who owns the Nutcracker and with whom (when it changes to a Prince) she experiences the most wondrous and exciting adventures. The 1st pipe and tamper in the series depicts one of the main characters of the story, The Nutcracker Prince. Your Alfred Dunhill pipe is guaranteed against faults in materials and workmanship for a period of 24 months from the date of purchase. Your Alfred Dunhill pipe will be repaired and any defective components will be replaced free of charge, or a refund will be made, provided that the fault falls within the terms of this Guarantee. Damage and/or defects caused by fair wear and tear, accidents, use which is unreasonable or inconsistent with Alfred Dunhill’s instructions, dismantling, or repair by persons other than authorised Alfred Dunhill repair specialists, or the use of components or accessories other than those recommended by Alfred Dunhill, are not covered by this Guarantee. This Guarantee is only valid provided that the completed Certificate of Guarantee is returned with your pipe to your nearest Alfred Dunhill shop or authorised dealership. Please note that your rights under this guarantee are subject to your compliance with Alfred Dunhill’s instructions as set out in this booklet. Please read the instructions carefully.